Home > AMT Blog > The Country Gold Tour Stops in Lancaster on September 17! The Country Gold Tour Stops in Lancaster on September 17! The Leroy Van Dyke Country Gold Tour showcases some of the greatest names, and voices, in classic country, and is perfect for anyone who loves the classic country sound. Leroy Van Dyke and his band, Barbara Fairchild, The Malpass Brothers, Marty Haggard, Gary Morris, and Rex Allen, Jr. are coming together for one show on September 17 at 3:00 p.m.
With pure classic country hits by some of its finest musicians, this is shaping up to be an unforgettable concert. 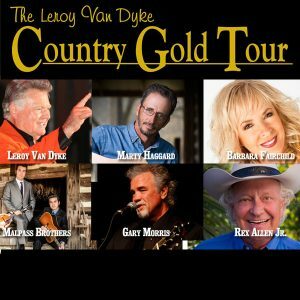 Make sure you get your tickets for The Leroy Van Dyke Country Gold Tour before they’re gone! This singer/songwriter is best-known for his hits “The Auctioneer” and “Walk On By”. “The Auctioneer”, now considered a country novelty standard, is the composition that catapulted Van Dyke into country music fame in 1956. Van Dyke co-wrote the piece with Buddy Black, and it sold over 2.5 million records. In 1994, Billboard magazine named “Walk On By” the biggest country single of all time. With a career spanning over 60 years, Leroy Van Dyke has recorded over 500 songs and continues a full performance schedule. This country and gospel singer is best-known for her 1973 hit “The Teddy Bear Song”. This single turned 1973 into a breakthrough year for Fairchild. It hit #1 on the country charts, peaked at #32 on the pop charts, and received a Grammy nomination. After several more country successes in the 1970s, Fairchild turned towards gospel music, releasing several solo albums and collaborations. This duo consists of Christopher and Taylor Malpass. They create their own new music while also promoting the work of classic country artists. They’ve toured with several of the greats, such as Merle Haggard, Willie Nelson, Doc Watson, and more. While touring, they’ve played some iconic classic country stages – like the Shetland Islands and Ryman Auditorium. “Memory That Bad”, the title cut video from their album, hit CMT Pure Country’s Top Ten. Marty is the son of country music giant Merle Haggard. While traveling with his dad, he sang harmony and played guitar. In the 1980s, Marty charted five singles of his own on the Hot Country Songs charts. The 1988 single “Trains Make Me Lonesome” peaked at #57 on the country charts. Based on this success, the Academy of Country Music nominated Haggard for Top New Male Vocalist. In the 1990s, he began recording Christian-themed music and decided to take up music ministry. Gary Morris is both a country star and a Broadway veteran. He is known for the 1983 ballad “The Wind Beneath My Wings”. More than 25 of Morris’ other singles reached the Billboard country charts, five of which were #1 hits. Morris has released nine studio albums. The 1983 album, Why Lady Why, earned a gold certification from the Recording Industry Association of America. Morris wanted to spend some time pursuing a serious acting career, so he took a break from touring and playing country music to give it a try. Blessed with a truly powerful voice, he was selected to play the role as Jean Valjean in the Broadway production of Les Misérables. The full symphonic recording of this production, including Morris’ vocals, is a platinum-selling, Grammy Award-winning album. He also appeared in Puccini’s opera La Boheme and several other productions. This singer/songwriter is best-known for his hits “It’s Over and “Lonely Street”. His father, Rex Allen, was known as a “singing cowboy” and the narrator of many Walt Disney Films. Rex Allen, Jr. started singing at the age of six. In the 1970s and 1980s, he released several hits and collaborations, including the 1980 duet with Margo Smith “Cup of Tea”. Since then, Allen has appeared on television shows and hosted a few. He composed and performs the alternate state anthem of Arizona, titled “Arizona”. He also narrated the 2000 movie, Me, Myself, and Irene, starring Jim Carrey and Renée Zellweger. With talents and voices like these in the lineup, you won’t want to miss out on this incredible show. Contact us today to reserve your tickets for September 17!